Soon after a spinal cord injury many of us start getting that sneaking suspicion that we’re missing out on life. Whether it’s an event we can’t attend because it not accessible or an activity we can’t do because of our paralysis, they begin to stack up. 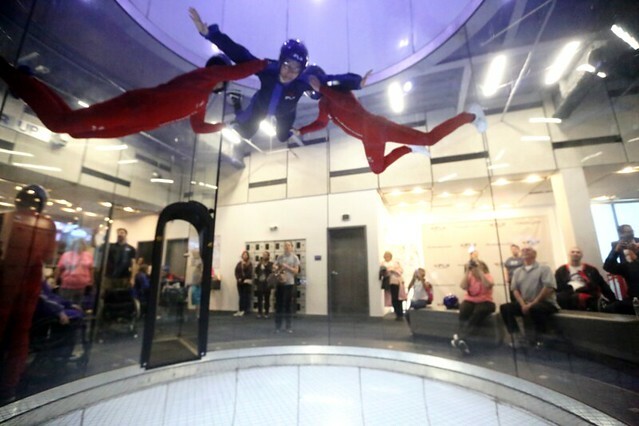 Joanna Bonilla, paralyzed by Lupus, put a temporary halt to that growing list – if just for one night – when she attended SPINALpedia’s Adaptive Indoor Skydiving Event at iFLY in Loudon, Virginia last month. “I was excited because I was finally able to do something on my bucket list. Excited because the dare devil in me was like FINALLY! 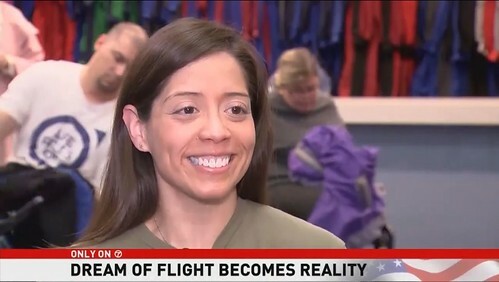 Finally, that I was able to do something I wanted to do before my injury.” A resident of Springfield, Virginia, which is not far from iFLY, Joanna signed up for our event when she saw our online flier. The psychological benefits of the wind tunnel in particular, which makes the indoor skydiving experience possible, were especially awesome to Joanna. “After I got over the shock feeling and I took in a deep breathe. I was able to relax and loved the feeling of feeling FREE. I was allowed to have FUN and let go. In my wheelchair, I over analyze everything (“Can I get in that way?,” “Is it wheelchair friendly?,” “Will I be able to do this?”). “At DPI, I was able to get my confidence back little by little. I am now stronger than I’ve ever been. I was able to do IFLY and every other adaptive activity because of DPI. She has also tried rock climbing and adaptive skiing in Colorado since becoming injured, but this 34 year old loves how easy it is to just get in some indoor skydiving in her own hometown. This entry was posted in Feature stories, News & Updates and tagged adaptive adventures, iFLY all-abilities night, indoor skydiving all-abilities, joanna bonilla on June 8, 2018 by Tiffiny. Annette wearing her creation. Note: It may look like the leg protector is touching the ground, but it does not touch the ground. Each leg protector is made to order. It would be fair to say that nature isn’t the most wheelchair friendly, and especially when it comes to the rain. From bulky raincoats to umbrellas that just don’t reach everywhere (leaving knees and shoes wet! ), what’s a wheelchair-user to do? Annette Flowe, a paraplegic from Germany, was sick of getting wet every time it rained at her beloved annual music festival each summer. But it was this experience that inspired her to come up with her ingenious idea. It may seem simple on face value, but it took someone like Annette with her German sensibility to realize that it was high time a quality waterproof leg protector was created for wheelchair-users. “For over 15 years, I have been going to the same music festival in East Germany, which takes place on the first weekend of July. There are a lot of open air stages and although the weather is usually good, almost every year there is at least one heavy rain shower during the weekend,” says Annette. 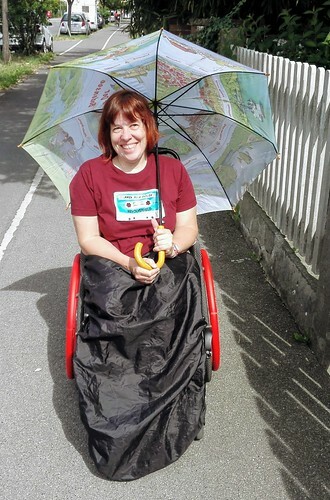 To create the perfect covering for a wheelchair-user’s legs in the rain, Dr. Eugene Emmer went on Reddit to poll wheelchair-users if they would appreciate such a product to keep them dry in the rain. Astonishingly, over 80% of people polled said they do not have an adequate way of staying dry in the rain. To understand what wheelchair-users needed even more OF, Dr. Emmer put together a group of 10 testers who use wheelchairs from around the world, including USA, Scotland, England, Germany and Lithuania. He sent a sample leg protector to each tester to get feedback. They received a lot of responses, from helping wheelchair-users find better ways to keep the protector on their legs to finding a better way to keep it on their lower legs. After the testing was completed, they decided to call it Rayne Shield. It can fold compactly into its carrying case as well so it can be stored safely and securely with you whenever it starts to rain. It also is available six different colors, including camouflage. The cost is $65, plus shipping to the United States. Look for the Rayne Shield to be available online late this summer. This entry was posted in Feature stories, News & Updates and tagged rayne shield, waterproof leg protector, wheelchair waterproof leg covering on June 7, 2018 by Tiffiny.